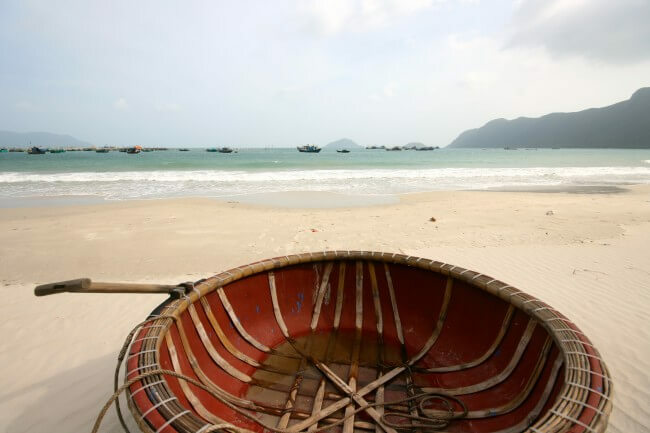 Con Dao Islands, Vietnam: A prisoner’s paradise. Or not. Is it just me or has anyone else noticed the alarming number of prisons in Paradise-like locations? Robben Island, Port Arthur in Tasmania… and now I have another one for you – the Con Dao islands off the south coast of Vietnam. Just imagine. John Smith of Barber Street in Birmingham steals a handkerchief from his local market on a windy October Sunday morning – he’s caught a terrible cold, you see, but is on his way to meet his new love. He obviously can’t be sneezing and snotting all over her but alas, as he goes to purchase said handkerchief, he realises he’s not a ha’penny on him. So he does what any good gentleman of the time would do and slips it in his pocket, making a mental note to stop by first thing in the morning to reimburse the jolly market chap with wind-bruised cheeks. But before he can cry “I’ve not a ha’penny on me,” he finds himself stripped of his clothes, shackled, and on a somewhat precarious boat to Tasmania. Oh the irony, he thinks, as his nose dribbles and runs for two weeks on end at sea but he’s no free hand to reach for his handkerchief. I’m sure the story went something along these lines when I visited the Tasmanian prison, which is located on the rugged Tasman Peninsula, surrounded by the ocean and forests, making for a pretty picture perfect location. But that was eight years ago so I’ve allowed myself some artistic license. But this time it was the Con Dao islands off Vietnam where I was heading. Just a 45 minute flight from Saigon (on a tiny propeller-armed plane that dipped and dived through the wind and lands on the tiniest runway I’ve ever seen, surrounded by water), the Con Dao islands are as easy to get to as anywhere else in ‘Nam. But for some reason no one goes. Maybe they heard about the flight. As we made our descent I looked at the ripples of water below, watching the waves crash into each other creating streams of small white lines across the blue mass, and closed my eyes tightly. This is it, I thought. We got closer and closer to the water’s surface until I started to wonder if the plane was a bit like that yellow duck bus in London that turns into a boat when it hits the Thames – maybe it would grow some rudders and we’d all be ok, I silently hoped. But then, just as some girls started screaming in the back and I was mentally selling my story to the Sun about how we ‘skimmed the water’ before the plane finally sank (I was going to live to tell the tale obviously), I heard that familiar sound of fast spinning wheels on tarmac and realised we were on land after all. What seemed like a few seconds later, we had reached the end of the runway. No probs there, the plane just did a bit of a three-point turn, came back on itself and pulled up in what can be best described as a car park. We all piled off a little confused, not sure where to go or what to do next but audibly muttering our thank you’s to the pilot under our breath. So we did the only thing that made sense and stood around taking pictures of our funny little plane in a funny little car park on this funny little runway. The security smiled and nodded, he’d seen it all before. We had made it to Paradise alive. And I was pretty pleased about that. 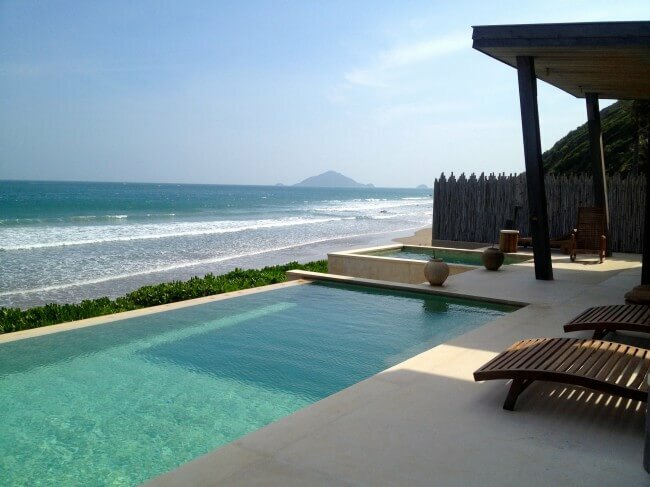 And there is no denying it – the Con Dao Islands might just be Paradise on earth. When I say islands, there is a cluster of 15 islands and islets that are ringed with stunning beaches and impressive coral, but most people visit Con Son the largest of the lot which is where I was to spend the next three days. I visited during the island’s ‘winter months’ – temperatures are still up to 30 degrees but the sea is rough and it’s quite windy. During the spring and summer months, it all looks a bit more like this. Photo courtesy of… the internet (taken by somebody who went at a better time of year than me). But either way I was impressed – isolated white sandy beaches and coves are waiting to be explored all over the island with gorgeous lush jungle and national parks inland. For a country where it is increasingly difficult to get off the ‘beaten track’ , the Con Dao Islands are a hidden gem. 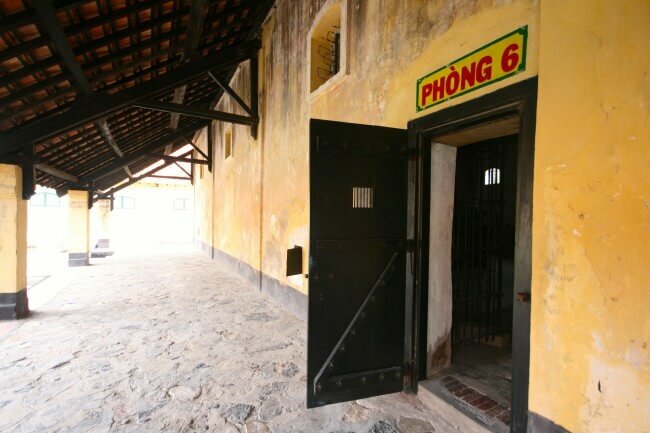 Less so for the prisoners who arrived there in their throngs during the French Colonial years and during the Vietnam Revolution. Not so much John Smith stealing a handkerchief, more like Nguyen raising an eyebrow over the leadership of the country at the time. 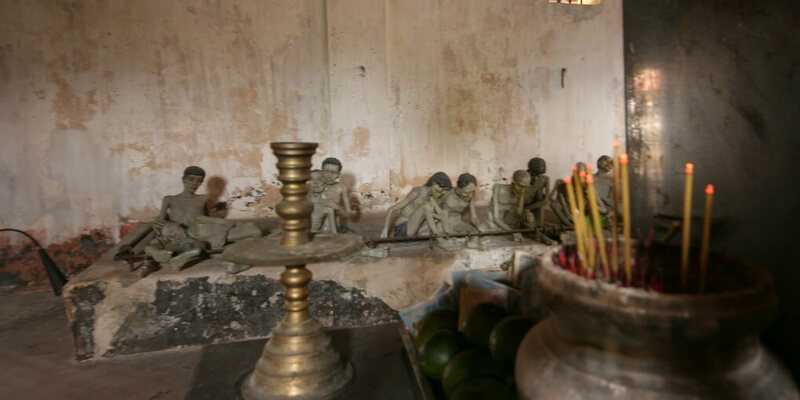 Today the island is littered with ruinous prisons and many Vietnamese treat it like a place of pilgrimage – some go to remember the activists who perished on the island, who are now seen as national heroes. 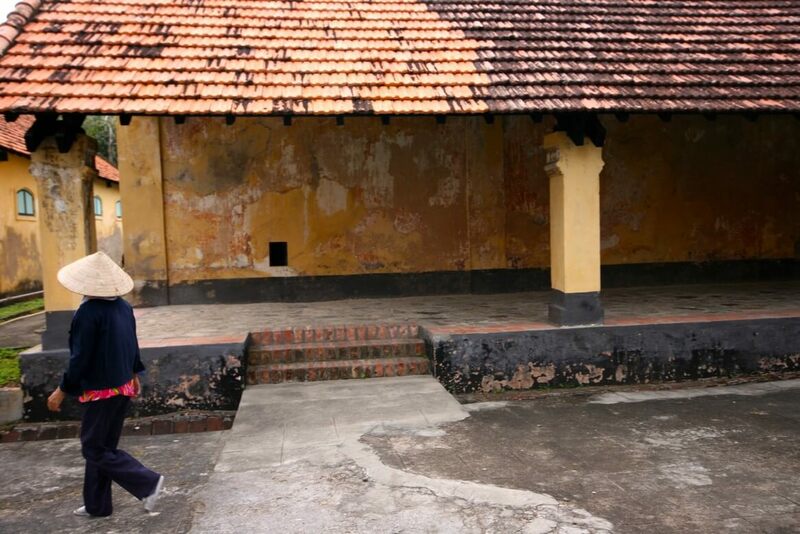 I headed to the largest – Phu Hai Prison – but it was not quite what I expected. I wasn’t really expecting to find a building quite so beautiful. Typical of traditional architecture in the 1800s, the red tiled roof on the buildings over-hanged the warm yellow chipped and peeling walls. Set in a U-shape around a pretty courtyard with a crumbling yellow church in the centre, there were no real indications of the horrors of its past. Until I walked into the first ‘cell’ on the left, that is. Perhaps I was expecting the beauty of the exterior to be matched on the inside – I don’t really think so – but as I walked into the first cell it caught me completely unaware and I gasped. 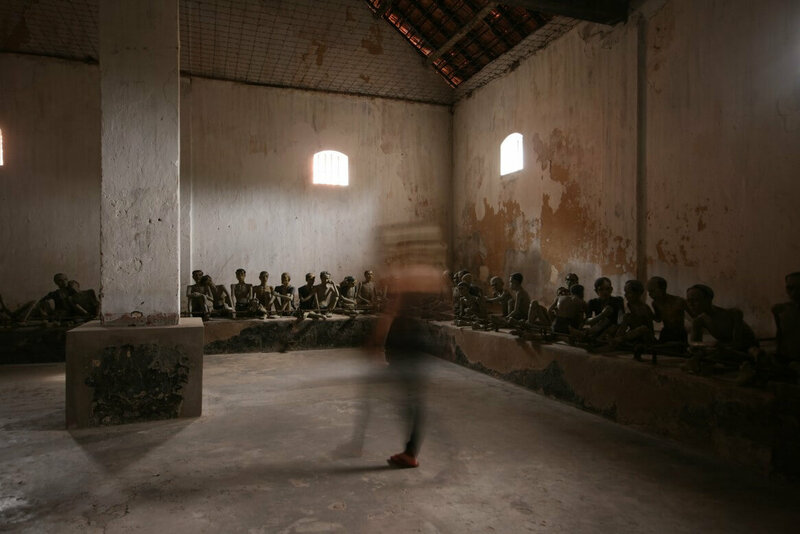 My nostrils filled with the scent of burning incense and as my eyes struggled to adjust to the dim light I just saw rows of bodies. 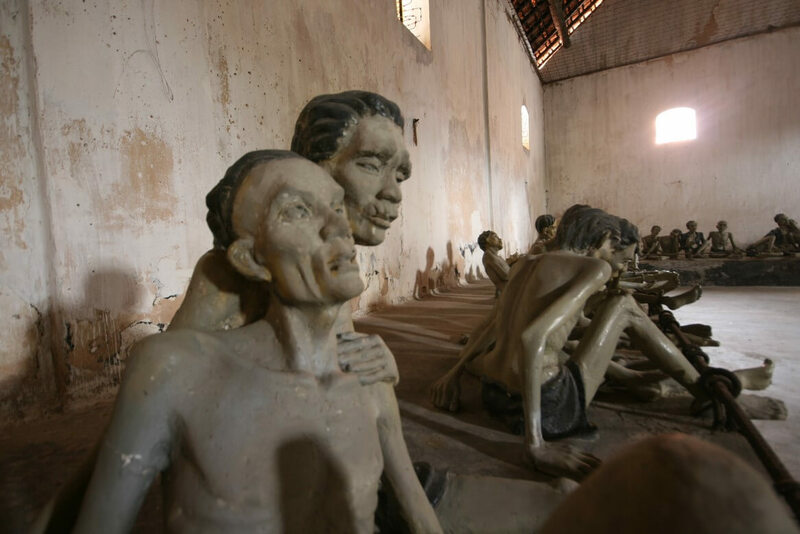 It took me a moment to realise that these were not, of course, the corpses of prisoners but in fact just statues shackled together in a bid to capture how it might have been. The result? Effective. The room felt so big and empty, exacerbated by the high-beamed ceilings that exposed the red tiles of the roof. It was silent. The only thing that was moving was the slow burning light at the tips of the incense sticks. I tip-toed across the room, as if not to disturbed the shackled statues and breathed in the incense. I was the only person in the entire complex except a couple of conical hat adorned ladies hosing the flowers in the courtyard. It was just me, confined in these four walls that had seen so many horrors. I dreaded to think how many had perished on the spot I was standing. I wanted to soak up the eerie atmosphere and run away all at the same time. In the end I took my camera out and tried to balance it on a candlestick holder besides the incense to serve as a tripod. I put it on self timer as to not move the camera when I pressed the shutter button. Suddenly, eight seconds into the count down and two seconds before the photo was about to be taken, the camera fell – only by about four inches to the table – but creating an almighty noise that echoed around the big empty room. It left a blurred ghost-like image of figures on my camera. Somewhat unnerved, I headed back into the sunlight, surprised by my own racing heart. I wandered into the church building that today houses photos from the past, giving you an idea of how it might have been for prisoners at the time. Skeletal thin, you saw dozens shackled together in close confinements. Sadly, Con Dao attracted worldwide attention in the 1970s because of its use of ‘tiger cages’, which were underground, knee-high barbed contraptions with barely enough room to crawl. Thousands of prisoners were said to have been held in them since the 1940s – some were made of barbed wire and were just left in the scorching sun, where prisoners would crouch with no shade for days on end. It is said the prisoners on Con Dao had just enough food to survive but were skeletal – and about 20,000 prisoners are thought to have died on the island. As I stared at the grainy black and white images the chill of the late afternoon tingled down my spine, and I turned back towards my beachside hut to watch the sun make its final descent over the hills behind. Yes, Con Dao is beautiful and may just be the ‘next big’ destination in Vietnam. It is likened to Paradise on travel sites across the web, but as I sat there watching the sun set I couldn’t help but think how the power of inhumanity can make even the prettiest places in the world Hell on Earth. But if you’ve not got a spare $1,000 for a night’s accommodation then there are a handful of hotels that are more aimed at the asian audience (smoke scented rooms, gold curtains, dated furniture etc). 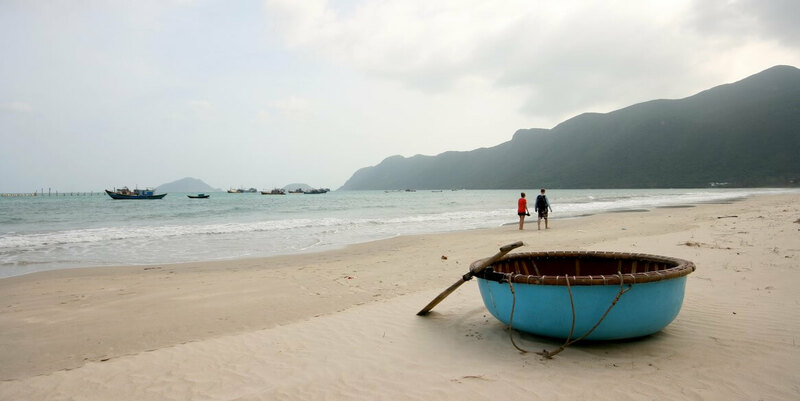 I opted for a place called Con Dao Camping, which has cute little triangular huts on the beach (about $25 per night) – they are actually pretty fancy huts with en-suites and air con etc, not to mention an almost unbeatable view. Hi am thinking of visiting the island in December with my children. Even though it is windy could u still sit on the beach and swim in the sea …????? 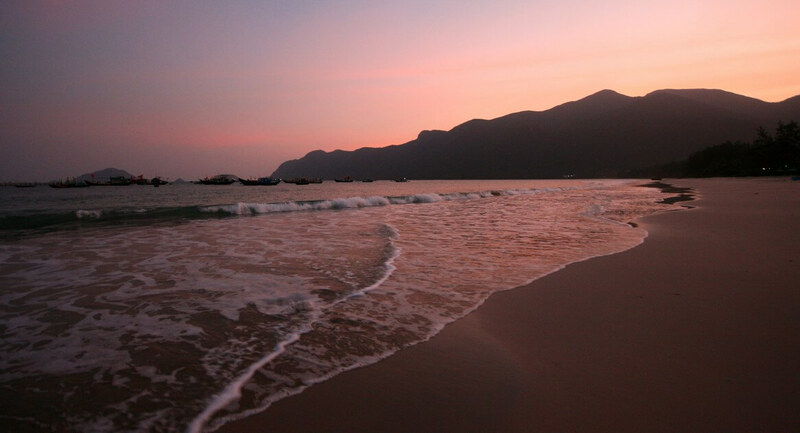 @ Liz: December is dry season in Con Dao so the sea is safe for swimming. No worries.